Do you like to travel? Ever wish you had nice vacation pictures to show off, but you never get to go anywhere because you can't afford it (but can easily afford this thing)? Well just slap this up on the wall and wait for the ooohs and aaahs from your friends and family. 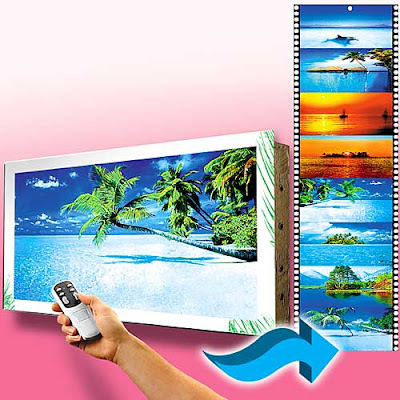 It features an array of generic vacation photos that scroll across the screen much like that 8th grade project where you made a TV out of two paper towel tubes, a cardboard box and a bunch of your pictures taped together end to end. Will impress no one and confuse all. Tim: Wow, are those pictures from your vacation? Tim: Really? Where are you? Bob: I couldn't find anyone to take a picture of me. Tim: Okay... You know that palm tree photo looks awfully familiar. Like the one I have as my screensaver on my computer. Bob: It's the most photographed palm tree in the world. Tim: Well, how come you only have 8 pictures? Bob: It was a very short roll of film. Tim: Okay...I'm going to leave now. Wow, those palm trees have to be the number one photo around the world. There's a wall mural at the local Chinese restaurant with them and I have a shower curtain with them on it too. And what do you know, I have the "soothing sounds of running water" in there too. But then it was only about $5 for mine! Because when you think of China, you think of palm beach lined beaches. Not rickshaws and lead paint. How'd We Get in Bed So Fast? How Did Everyone Get a Headache at the Same Time? "You May Also Like" does not claim credit for all images featured on this blog. All photos and visual content are copyright to their respectful owners. If you own rights to any of the images and do not wish them to appear on the You May Also Like blog, please contact You May Also Like via e-mail and they will be promptly removed. Theme images by diane555. Powered by Blogger.